There's nothing better than achieving that perfectly balanced mix of something casual with something glam. This sweatshirt dress is so simple in design and that's exactly why I fell in love with it. I love that it can be worn with heels, flats or sandals or layered over a pair of leggings with boots and a great coat (which I definitely plan on doing once the temps drop). Since less is always more for me, a sparkly bracelet and my favorite lace heels were all the accessories I needed to achieve that "casual glam" look. I hope everyone had a great weekend! 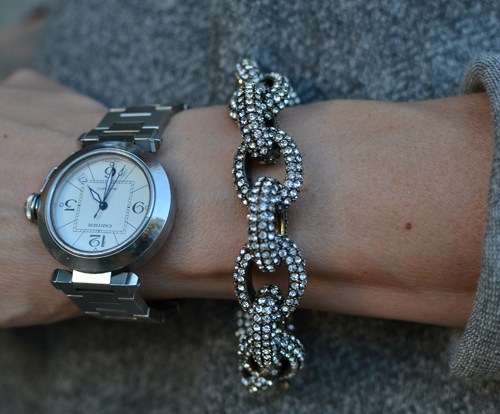 How great is this F21 version of the J.Crew pave link bracelet? this looks fabulous! love the heels, that dress looks so comfy! Just ordered that bracelet for myself - can't wait! Love this comfy dress and how you made it look so sophisticated!! Beautifull mummy, I like it! You look great! I love how you mixed high and low. The gray and glittering silvertone bracelet really compliments your coloring. Perfectly styled as usual. I love that you haven't lost your sense of style while pregnant. I'm sure most women struggle with that. Have a great one! You pull off the casual chic look more perfectly than anyone. Love this! Love that bracelet too -- you're so right, it looks just like J.Crew's version! i drool every time you wear those shoes...lol! they are SO pretty. this dress is SO something i would love to wear. Wow that dress looks so comfy cozy! Way to go! You look gorgeous and how fun is that dress? This is stunning! Love the dress. You have had a beautiful pregnancy! Great look, love the bracelet! You look amazing!! I love simple and chic looks. I just discovered your blog and I am your new fan and by the way thank you for making my day with the bracelet bc I have been wanting the one from Jcrew but didn't want to spend the money on it! you look so pretty! love the sweater dress & bracelet! What a great sweatshirt dress!